​Who doesn’t love mini fridges? A mini fridge is a great addition to almost any room. Whether you are buying it for a college dorm, studio apartment, office break room or your garage, a mini fridge is both practical and inexpensive. In order to get the best deal on a mini fridge, here is a list of the top-rated models. Mini fridges are perfect if you do not have the space for a full-sized refrigerator. They are also quite inexpensive comparatively. Mini fridges are quite portable, making them a great option if you need to move them frequently. ​Here are some frequently asked questions regarding purchasing and owning a mini fridge. ​What Is a Mini Fridge? ​A mini fridge, or compact fridge, is defined by its size. Usually, anything 4.5 cubic feet or smaller qualifies as a mini fridge. Sizes can vary, and some mini fridges are only 1.7 cubic feet. ​Do Mini Fridges Have Freezers? ​Some mini fridges have a second door for a freezer compartment, much the same as a full sized refrigerator. Others have a small shelf with an additional thermostat. This shelf is designed to keep things colder, similar to a freezer. Some models do not offer any temperature variations and don’t have a freezer. One model, in particular, is only a freezer and does not provide a refrigerated compartment. ​Can I Use My Mini Fridge Outside? ​With the exception of the Bull Outdoor Products model, none of these mini fridges are for outdoor use. 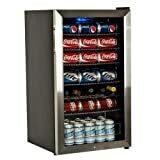 The Bull Outdoor Products mini fridge is specially designed for outside use. ​Depending on the size and functionality, the price can vary dramatically. The mini fridges on this list cost between $45 and $319. In general, more expensive units tend to have more cubic feet. We selected each mini fridge carefully in order to highlight the best model available in 2018 at that particular price point. ​This mid-range model offers some great features and a reasonable cost. It has enough space on the door to hold a 2-liter bottle. The exterior has a flat back, which allows it to fit easily into a small space. The fridge has a small freezer section and includes an ice tray. This model feels quite roomy for such a small mini fridge. It’s great for anyone who has a very limited amount of space. Some customers don’t like the hinge on the door, which is not as sturdy of a design as some other models. ​This mini fridge is quite large for being a mini. It has 3.2 cubic feet, which is one of the larger models available. It comes in a variety of colors, so you can easily customize your dorm room, office cubicle or wherever else your mini fridge will call home. It has two glass shelves that are adjustable, making it feel more like a full-sized refrigerator. However, this mini fridge is pricey compared to other, smaller models. If you are buying a mini fridge for a few drinks and an occasional take-out box, this isn’t the mini fridge for you. If you are planning on ordering this unit online, be cautious and be sure to check for any possible dents or damage. Some customers have had issues with receiving a damaged mini fridge. ​A convenient alternative to the standard RCA Igloo, this model features two doors, just like a regular refrigerator. It has a top freezer, which you can access without opening the refrigerator door. This unit also comes with a bottom drawer to keep vegetables crisp, a can dispenser and a basket on the door. It looks and feels just like a larger RCA refrigerator. However, it is more expensive than the traditional Igloo. If you aren’t planning on using the freezer space, the additional price and features are not worth it for you. But, if you want a mini fridge with a variety of storage options, this is a great choice. This is one of the most unique options available. This tiny fridge can is both a refrigerator and a food warmer. Just wait at least half an hour in between functions. It is extremely small and portable and is designed to work in a home or car. It has a USB adaptor, car adaptor and a battery pack. It doesn’t use a compressor like most refrigerators but instead uses thermoelectric cooling. Some customers felt it was not as effective at cooling drinks, but it runs almost silently compared to a traditional mini fridge. If you want a convenient and portable way to store a few drinks, and like the option of warming food as well, this unit is an excellent choice. ​A professional and expansive mini fridge, the Danby models offers 4.4 cubic feet, which is one of the largest mini fridges available. It comes with a stainless steel door, which helps avoid scratches. The interior is similar to a larger unit, which helps give it a full refrigerator feel. It comes with three adjustable shelves, a basket on the door and a large drawer for vegetables. At $209.99, it’s one of the most expensive mini fridges on the list. If you want the most space you can get and a durable design, this is a great choice for you. ​If you want a mini fridge only for drink storage, consider this option by EdgeStar. The ultimate beverage cooler, this unit can hold up to 103 cans. It’s great for workplaces, parties or a small business cooler. It comes with a built-in lock, which is a great addition if it is in a communal room, like a break room or business location. While it has a huge capacity for beverages, it’s not a practical mini fridge for other uses. At $319, it’s also quite expensive for its size. 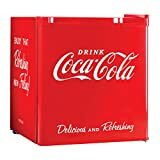 If you want a highly specialized and effective mini fridge that is lockable, this beverage cooler will work well for you. 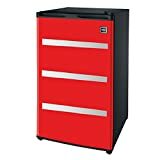 ​This stylish and unique mini fridge is specifically for a garage or workshop. Its door is painted to look like a toolbox, and the four caster wheels help complete the image. It has a freezer and can dispenser, so it has a good variety of storage options. At $141.64, it’s a bit expensive for the 3.2 cubic feet of space. But, if you want a mobile mini fridge that blends in with your workspace, or reminds you of your workshop, this is a great and fun option. ​If a mini fridge isn’t cold enough for you, consider this mini freezer. A unique option, it has one shelf, and the entire unit reaches freezer temperatures. It’s perfect if you want a smaller freezer, and don’t need any refrigeration temperatures. Some customers feel this model is a bit louder than mini fridges. It is also expensive for its size when compared to a traditional mini fridge. ​This mid-range model is durable, spacious and conveniently sized. 2.7 cubic feet provides enough storage for cans, bottles and food, along with a full-length freezer. It has two shelves and lots of door storage. The unit is designed to be short enough to fit under a desk, yet still keep a large storage capacity. It has a durable door front and an adjustable thermostat. It’s a great, well-rounded unit for anyone who needs high-quality storage at a reasonable price. ​If you want a unique look to a basic mini fridge, Nostalgia has a 1.7 cubic foot model that has the Coca-Cola graphics on the entire exterior. 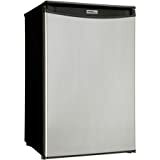 This eye-catching mini fridge is a great choice if you are going to college, or nostalgic about your years in college. The entire is basic for its size. It has a small freezer shelf, a wire shelf and space on the door for several cans or a 2-liter bottle. It’s a bit more expensive than similar sized mini fridges, so you are paying a premium price for the exterior graphics. However, if you are a big fan of Coca-Cola or nostalgic items, this is a fun mini fridge for you. ​This unique mini fridge is made for outdoor use. Whether it is in a garage, outdoor kitchen or porch, this mini fridge is a great option. Its stainless steel door is durable and stylish. It’s 4.4 cubic feet doesn’t include a freezer, so there’s extra refrigerated space. Customers like its outdoor protection. But, at $331.36, it’s quite expensive for its size. If you need a mini fridge to operate outdoors, this is a great choice. If you aren’t planning on using it outside, this unit is far too expensive for its other features. ​Each of these mini fridges is specifically designed to meet a certain need. Whether you are looking for a budget model, a high-capacity mini fridge or a novelty one with unique features, this list has everything you need. Carefully consider what functions you would like to see in your mini fridge. If you want maximum drink capacity in a small space, consider the EdgeStar beverage cooler. 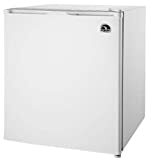 Or, if you are looking for a budget model to take to college, consider the RCA 1.7 cubic foot fridge. A color, multi-function option would be the Cooluli mini fridge. 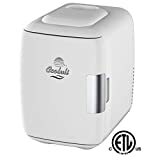 Regardless of your decision, each of these mini fridges is highly rated and a great choice for their price.